Paper Bush has amazingly fragrant clumps of little yellow tubular flowers (it's in the Daphne family!) on the tips of branches from January to March. 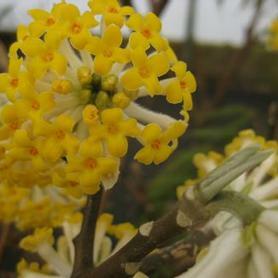 Long tropical-looking deciduous green leaves, must be in a very protected site (and keep mulch away from the base of the plant) but the winter fragrance of Edgeworthia chrysantha flowers on a warm day makes it worth it. 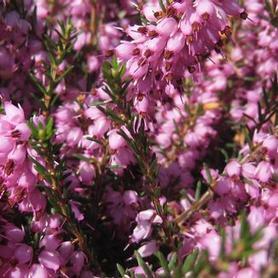 Erica x darleyensis 'Mediterranean Pink' is a Heath that has pink flowers in March and April. It has a low mounded habit and is salt tolerant and evergreen. It prefers a well-drained site. 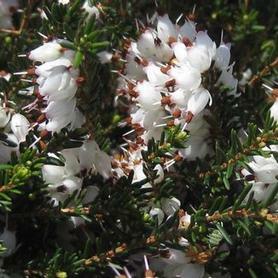 Erica x darleyensis 'Mediterranean White' is a Heath that has white flowers in March and April. It has a low mounded habit and is salt tolerant and evergreen. Does not tolerate "wet feet".